A Local Growth Fund project to create three new state-of-the-art industrial units on Monkton Business Park, South Tyneside, is nearing completion. The £5m scheme by Washington-based Hellens Group has introduced 58,000 square feet (5,387 square metres) of new industrial space to the Hebburn-based Business Park, which is expected to create over 100 jobs. The agents for the units, GVA (www.gva.co.uk) and HTA Real Estate Ltd (www.htare.co.uk), are currently seeking prospective tenants from the manufacturing sector. 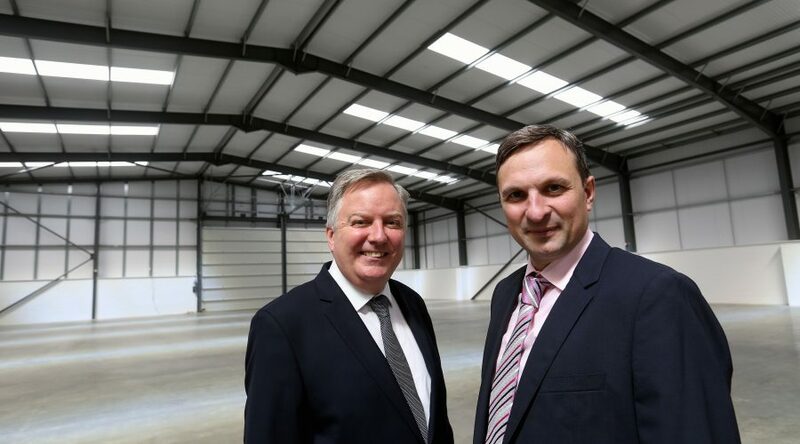 Gavin Cordwell-Smith, chief executive at Hellens Group, said: “We were delighted to receive £1.27m from the North East Local Enterprise Partnership’s (LEP’s) Local Growth Fund to support the build of these new industrial units, which are a real coup for the region. In addition to funding from the Local Growth Fund, Hellens Group also received loan funding of £1.7M from the North East Investment Fund (NEIF), an evergreen loan fund also administered by the North East LEP. Andrew Hodgson, chief executive of the North East LEP said: “This project is a fantastic example of the Local Growth Fund in action. The Northern Powerhouse and Local Growth Minister Jake Berry said: “This government is committed to boosting economic growth across the whole of the Northern Powerhouse and building a country that works for everyone. Through this investment of £1.27m from the Local Growth Fund towards the Monkton Business Park, we are giving businesses in the North East the tools and resources they need to expand and flourish. Monkton Business Park has rapidly developed into a key business location in South Tyneside. The addition of the new units makes it one of the key Business Parks in the North East. With close links to the A19 and A1, it offers businesses easy access to both Sunderland and Newcastle, and is well placed to serve manufacturers with supply chains north and south of the River Tyne. Importantly, it is less than 15 minutes away from the planned International Advanced Manufacturing Pak (IAMP) and Nissan’s Sunderland car plant. The site is already home to a number of companies including Siemens, Hitachi Construction Machinery Ltd, Variable Message Signs (VMS) Ltd, Ford Component Manufacturing, Clugston Construction, Kier North and Keepmoat, along with many others. Leader of South Tyneside Council, Councilor Iain Malcolm, said: “Seeing these much needed industrial units nearing completion is excellent news for South Tyneside. This project supports the Council’s strategic vision for economic growth across the Borough, providing first class business facilities, creating more job opportunities and making South Tyneside a place for the private sector to invest. The £270.4m Local Growth Fund, secured as part of the North East Growth Deal, supports the North East LEP’s delivery of the Strategic Economic Plan, which aims to create 100,000 more and better jobs by 2024. The North East Investment Fund was established as an evergreen loan funding to support capital projects that will lead to job creation.